I wasn’t sure what to expect from an Adventure Cruise. The word “cruise” conjured up images of vast banquet halls on huge vessels, and yet the word “adventure” denoted exciting exploits into previously unexplored parts of the world. It sounded like an oxymoron, but then it was explained to me: small ships that can dock where the big ships can’t, a sustainable style of travel, like-minded travel mates and local leaders to guide you along the way. It sounded great. I was (pardon the pun) totally on board. 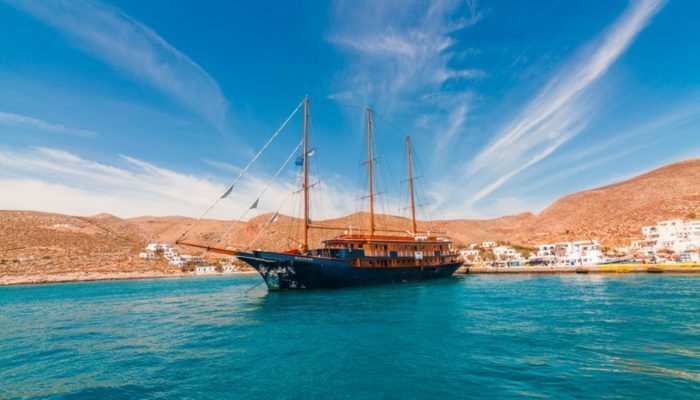 But if you still have questions about what exactly an Adventure Cruise entails, read on; I may have just the answers you’re looking for. Greek music and dancing on board the ship. With two local leaders (that is, people who speak the language and know their country like the back of their hand) by your side, your group can really get to the heart of a destination. Our leaders, Dina and Olga, were fantastic at answering all our questions about the places we visited, recommending what to do in our free time, helping us coordinate reservations for restaurants on shore, and arranging any experiences we wanted to have. 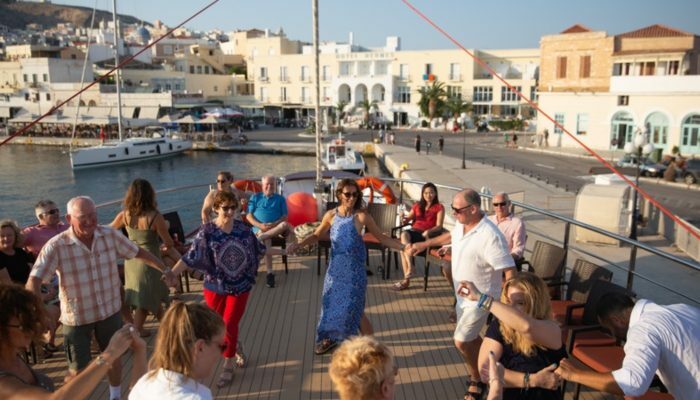 For example, my whole group had been begging to see a traditional Greek music and dance performance, so they arranged for a band and a dance troupe to join us on the ship. With Adventure Cruising, it’s all about the destination. This means that you’ll likely be spending minimal time on the ship and lots of time actually seeing the place you’re visiting. Most of the sailing is done at night, so you can wake up in port and spend as much time as possible on shore. 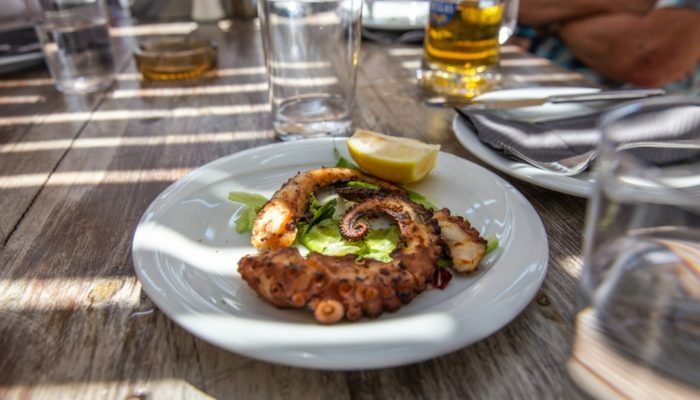 One of the many delicious plates of grilled octopus we ate. 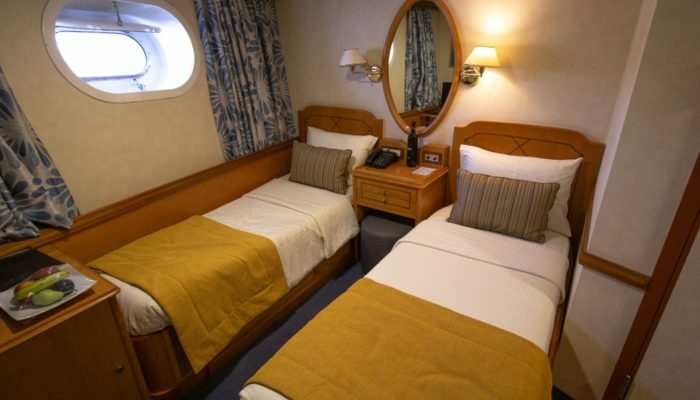 Most Adventure Cruises have what is referred to as “half-board” service. This means that two meals per day – breakfast and then either lunch or dinner – are served on board the ship. I like to refer to it as “the best of both worlds” because it gives you the opportunity to eat the delicious (and 90% locally sourced) food prepared by your on-board chef, as well as sample the local cuisine. In addition to the delectable a la carte dinners and tasty breakfast buffet, there’s a fully stocked bar complete with bartender. And there was always water, tea, coffee, fruit and other snacks available. 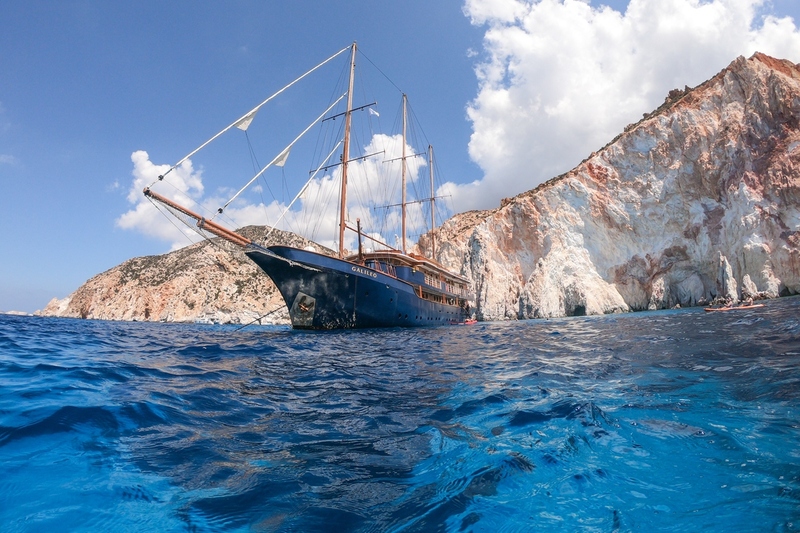 The Galileo, another ship used on Adventure Cruises in Greece. One major concern for many potential cruisers (myself included) is the possibility of seasickness. Thankfully, this was a non-issue for almost everyone on my tour. Despite hitting some stormy weather, our captain, Michalis, was able to slightly alter our itinerary to essentially outrun the storm. He and the rest of the crew made sure that we were never sailing directly into heavy winds, minimizing our time in choppy waters. Furthermore, most of the sailing was done at night. This meant that the waves gently rocked you to sleep instead of causing that dreaded seasick feeling. But if anyone ever felt queasy, there was motion sickness medication readily available on-board 24/7. Each ship only carries about 30-50 passengers. I was on board the Panorama II and I found it to be the perfect size – small enough that you actually get to know your fellow passengers, and big enough that you had some privacy if you wanted it. Luckily, I almost never wanted it. Every traveller on my tour was from a different background and had varying amounts of travel experience, yet we all got along exceptionally well. One thing that united us all? The desire to have authentic adventures and truly experience a destination. Although the ships are small, they are well-equipped. Having done both a traditional cruise and Adventure Cruise, I can say that the rooms are significantly better on an Adventure Cruise. My lower deck room even had its own porthole! Each room comes equipped with a TV, a mini-fridge, and an ensuite bathroom (complete with hairdryer). The only thing that is constant is change. No matter how much planning is done, there may be a few surprises along the way, but that’s all part of the adventure. And sometimes it leads to wonderful things. When our itinerary was altered because of the aforementioned stormy weather, this ended being a good thing – minimal seasickness and two new islands that we didn’t originally plan on visiting. 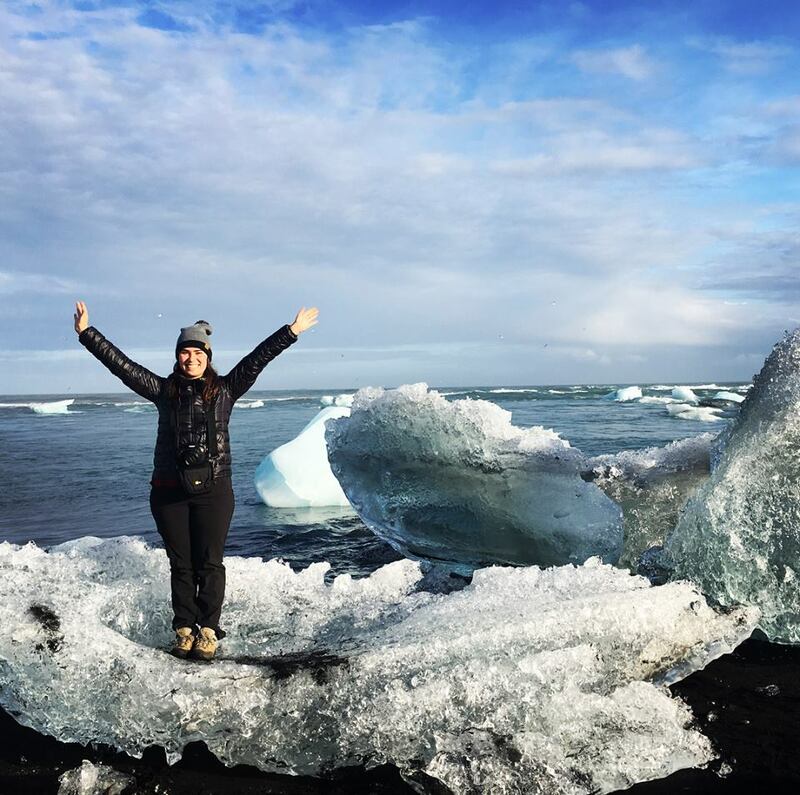 In the words of one of our local leaders Olga, “You signed up for an Adventure Cruise, and you’re definitely getting an adventure!”. It’s up to you to embrace it and go along for the ride. Have we answered all your most pressing Adventure Cruising questions? Browse all our Adventure Cruises. Still have a something you’d like to ask one of our adventure consultants? Contact us.